"You may recall that you provided the cake and desserts for our wedding - now nearly three years ago, people still RAVE about the desserts! And we tell all of our friends to work with you for their weddings!" Our New York style Signature cheesecakes are baked to perfection. Call 412-882-9960 to order. Black Forest Cheesecake - Cherry Amaretto flavored cheesecake in a chocolate cookie crust, topped with cherries, whipped cream and drizzled chocolate. Cappuccino Cheesecake - Creamy coffee flavored cheesecake in a biscotti crust and topped with a pool of dark chocolate ganache, whipped cream border and chocolate covered Espresso beans. 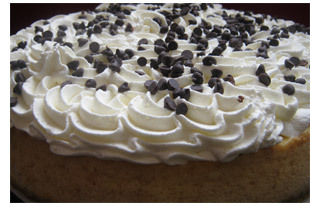 Chocolate Chip Cheesecake - Ghirardelli chocolate chips are sprinkled throughout this creamy delight. Topped with whipped cream and chocolate chips and sitting in a traditional graham cracker crust. Chocolate Marble Cheesecake - Rich chocolate swirls through this original flavor cheesecake garnished with whipped cream border and a drizzle of chocolate. Graham cracker crust. Chocolate Decadence Cheesecake - Smooth and creamy chocolate cheesecake in a chocolate cookie crust, topped with rich chocolate ganache, whipped cream border and Ghirardelli chocolate chips. Chocoholic delight! Key Lime Cheesecake - Tart Florida Key Lime flavors this highly popular cheesecake which is now topped with our own lime curd topping. Graham cracker crust and whipped cream dollops. Oreo Cheesecake - Oreo cookies are blended throughout this creamy vanilla cheesecake, sitting in an Oreo cookie crust, topped with dollops of whipped cream & Oreo cookie crumbs. Original Cheesecake - For the purist, or can be topped with your choice of Blueberry, Cherry, or Strawberry topping. Graham cracker crust. Patriotic Cheesecake - A Signature Desserts original, this original recipe cheesecake in a graham cracker crust is topped with a border of whipped cream, then cherries, then more whipped cream and blueberries in the center. Beautiful presentation! Turtle Cheesecake - Southern pecans are baked into the top of this vanilla cheesecake, and then we drizzle buttery caramel and chocolate over the top for a beautiful presentation. Graham Cracker crust. White Chocolate Cheesecake - Our original cheesecake with melted white chocolate blended through it, very rich and satisfying sits atop a slice of yellow cake crust. White Chocolate Raspberry Swirl Cheesecake - Our white chocolate cheesecake with swirls for wild raspberry throughout. Topped with whipped cream border - our #1 selling cheesecake!